Vancouver, British Columbia, August 22, 2018 – Pacton Gold Inc. (TSXV: PAC, OTC: PACXF) (the “Company” or “Pacton”) is pleased to announce that further to the Share Purchase and Option Agreement (“SOPA”) to acquire up to 80% ownership interest in Arrow (Pilbara) Pty Ltd ("Arrow Pilbara"), an Australian company wholly owned by Arrow Minerals Limited (ASX:AMD) (see news release dated May 14, 2018), the Company which currently owns 51% of Arrow Pilbara has agreed to terms to acquire the remaining 49% ownership in Arrow Pilbara. Arrow Pilbara holds two granted tenement licences and two applications for licences, comprising of a total of 609 km2 (the “Property”). The Property is an advanced gold project portfolio which consists of conglomerate gold targets within the Witwatersrand Basin age-equivalent Mallina Basin. Gold-arsenic anomalies identified along structures which host gold mineralization on adjacent properties. 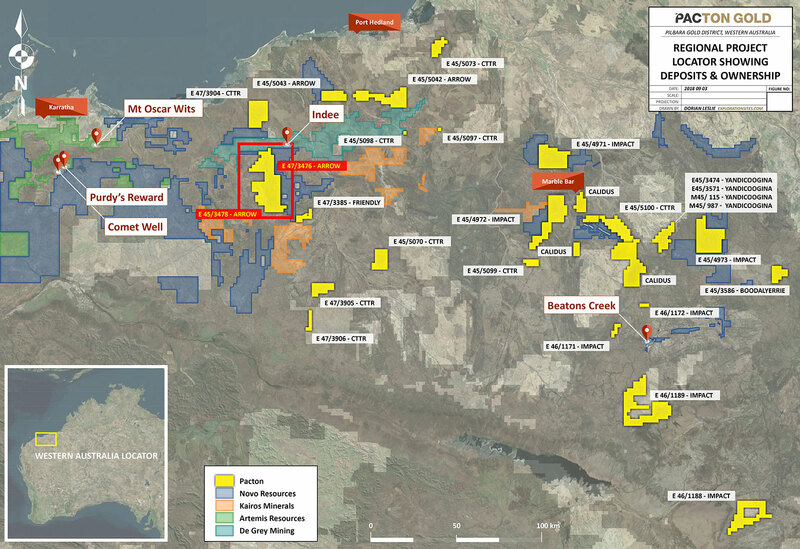 Under the terms of the Agreement, the Company will acquire the remaining 49% ownership interest in Arrow Pilbara it does not own by paying Arrow a total of $1,000,000 and issuing to Arrow 2,000,0000 common shares (“Consideration Shares”). Arrow has agreed the Consideration Shares will be subject to a voluntary escrow period to June 30, 2019. By entering the share sale agreement, the Company is released from certain obligations relating to the option to earn a further 29% ownership interest in Arrow Pilbara under the SOPA. Pacton will be required to meet its obligations to payments linked to the grant of two applications for licences and discovery of measured, indicated or inferred resource on the Property.